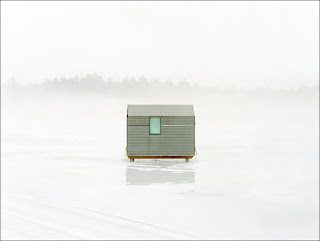 For several years, I worked on a project photographing ice fishing shacks in the lakes region of Maine and New Hampshire. I’m interested in these “bobhouses” for the way that they illustrate a primal narrative whose elements are simply shelter, food, warmth, and an ongoing battle against the caprices of nature. They are entirely utilitarian in their purpose, using lightweight windproof materials such as foam insulation sheet metal, plastic, or wood, yet put together in surprisingly ingenious ways, appearing as crude minimalist sculpture. I prefer to photograph on milky days in rain, fog, and snow, when the light is filtered and the range of color is extremely narrow. This makes the shacks seem all the more mysterious, as if they have been airlifted onto the scene, opening up the narrative rather than confining it to a documentary study of vernacular architecture. These are awesome. I know we have some similar photos from our own trips.